By the late Spring of 1945, the American war effort was fully focused on defeating the Japanese armed forces. American warships had all but decimated the Imperial Japanese Navy and blunted further attacks south into Australia and New Zealand. And though Japanese forces were resorting to more or less desperate means to combat the Allied offensive, a protracted island hopping campaign allowed the U.S. Army and Marines to gain valuable footholds at Iwo Jima and Okinawa by June. These were more than tactical victories, however. In addition to smaller islands such as Guam and Tinian and Saipan in the Marianas, the U.S. Army Air Force now had its first group of forward airbases for its sustained aerial attack against Japanese cities. The first had already occurred on March 9, 1945—a massive 300-plane raid against Tokyo that left 16 square miles of dense urban fabric in cinders and killed 80,000. And since then, U.S. Army Air Force operations (under the command of Generals Curtis E. LeMay and to a lesser extent, General Lauris Norstad) had been centered on the systematic razing of targets on the Japanese homeland. Despite these successes, and even up until the atomic bombing of Hiroshima and Nagasaki, the issue of an invasion of the Japanese mainland had always been on the table. General Douglas MacArthur and Admiral Chester Nimitz were anticipating that the invasion of Kyushu—dubbed Operation OLYMPIC—would commence by November 1, 1945. And questions always remained: how long would it take for the invasion to succeed, and with how many casualties? One reason for such worries was that an attack on Kyushu was, for lack of a better word, obvious. Indeed, by the Summer of 1945, Japanese forces were already massing on the rocky island—13 divisions (about 450,000 servicemen) and 10,000 aircraft were bring assembled to repel a potential Allied invasion. 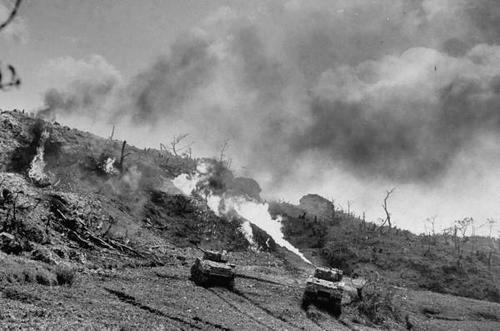 As important is the fact that Kyushu provided a particularly difficult terrain—thick forests, volcanic outcroppings, and steep mountainsides would only exacerbate the difficulties of an assault like OLYMPIC. The topography of this anticipated battle may have looked, felt, and smelled something like those found on Okinawa and Iwo Jima, and yet planners calculated that the November invasion could be several orders of magnitude costlier than the bloodiest campaigns in the European theatre. Gas lends itself to use in such special situations as confront our forces reducing a heavily defended and strongly fortified island of extremely broken terrain and relatively small dimensions. It is to be doubted that it could be employed in general offensives in open country, for it would hamper the user as much as the enemy. Thus the lesson of gas is special, not general, and tactical, not humanitarian. The charge that it is inhumane is both false and irrelevant. With the weapons now being used, almost none of the Japanese on Iwo [Jima] will survive the attack. The use of gas might save the lives of many hundreds of Americans and of some of the Japanese as well. The reference to the battle then being fought at Iwo Jima is also poignant for a very specific reason. At one point, the editorial declares that "Jap dugout defenses of the type found on Iwo Jima would present an ideal testing ground to determine whether we could render the enemy impotent and materially reduce our own casualties. New weapons, such as the rocket, the aerial bomb, and the 4.2 inch mortar, all of which could launch gas with extreme accuracy against a holed up enemy, provide the means." As it would out, the Army would begin testing the effects of poisoned gases and other chemical agents in case of an invasion of Japan—on American soil. In May 1945, General Marshall authorized Project SPHINX with the goal of determining "The best material, either available or under development, for reducing Japanese caves and underground fortifications; and ... [t]he best means of employment of that material." Spearheaded by the Army General Staff, the Technical Services of the United States Army, and the Chemical Warfare Service (CWS), the goal of Project SPHINX was, in essence, to test the efficacy of chemical weapons against the network of caves, pillbox bunkers, and underground facilities that might be encountered on an attack on Kyushu. The Army was primarily interested in assessing a lethal portfolio of toxic agents such as Phosgene, Cyanogen Chloride, Hydrogen Cyanide, and Sulfur Mustard, as well as smoke munitions and napalm-based weapons. For this testing, however, the Army would use the equipment and facilities at Dugway Proving Ground, Utah as a stand-in for the rocky coast of Japan. Dugway's personnel were no strangers to the shadowy business of simulation. During the Second World War, Dugway was one of the Army's premiere locations for the testing of chemical and biological ordnance. 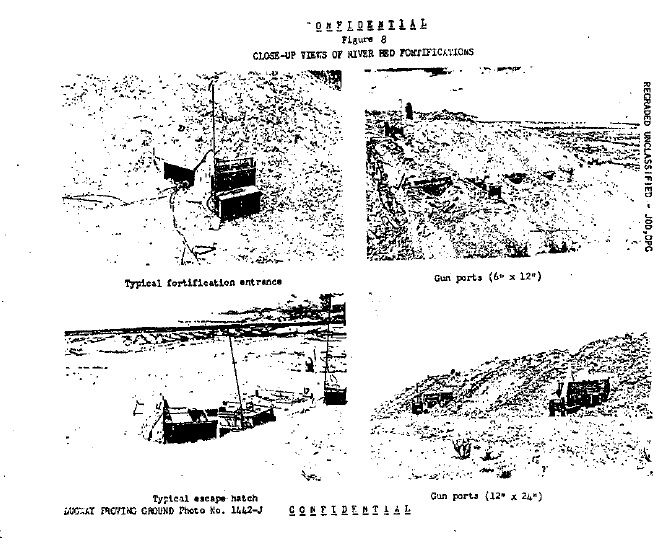 In 1943, "Typical German and Japanese Structures" designed by architects Erich Mendelsohn, Konrad Wachsmann, and Antonin Raymond were erected at Dugway and were bombed, destroyed, and rebuilt over and over to test the Army's new M-69 napalm incendiary bomb. The three architects provided the CWS with vital information about construction techniques used to build urban housing in Germany and Japan. Mendelsohn's and Wachsmann's research led to the design and construction of a 1:1 scale model building (presumably dubbed "German Village" because it "represented" various construction and framing techniques in Germany). Likewise, Raymond's work resulted in the building of a "Japanese Village." Here, building became part of a testing program—a controlled set of conditions in which German and Japanese architecture was rendered susceptible to firebombing. Project SPHINX relied on a different kind of spatial knowledge for its own simulation. If the work on the model German and Japanese villages demanded the mobilization of architectural expertise for weapons testing, then SPHINX required a more nuanced understanding of landscape and geology in order to "simulate" the island of Kyushu under battle conditions. Here, then, the use of the word "Typical" becomes important. The Chemical Warfare Service labeled the German and Japanese structures as "Typical" because they represented a statistical majority of German and Japanese building types. Similarly, for SPHINX, the challenge was to recreate a network of underground fortifications as might be found on the rocky coast of the Japanese Home Islands. For this, the Army and CWS would build, in essence, models of bunkers, and underground facilities using preexisting mineshafts, tunnels, and caves already located in at Dugway Proving Ground. 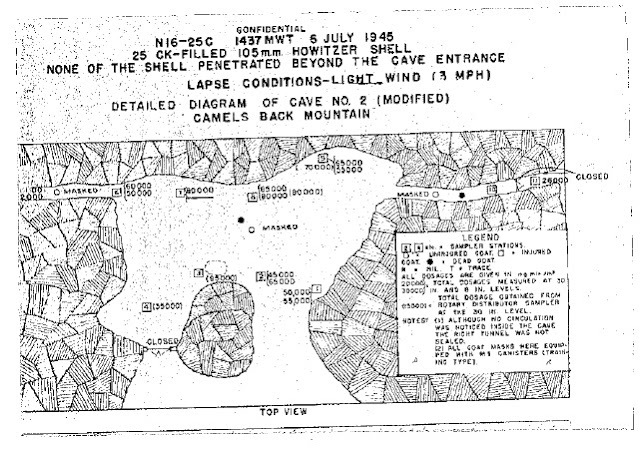 Four areas were chosen for this testing regime: Camels Back Cave No. 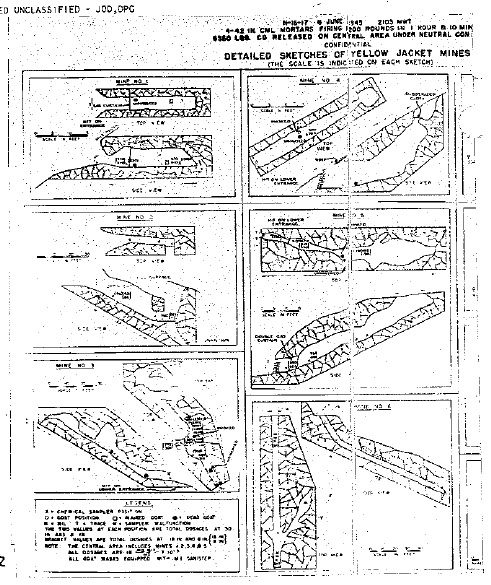 2, a "natural cave located near the crest of a limestone ridge"; the Great Western Mine, a tunnel located in the Dugway mountains measuring 175 feet in length; the Yellow Jacket Mine Area, a network of mine shafts and tunnels also located in the Dugway mountains; and the "River Bed Target Area", a large promontory jutting into an arid river bed. 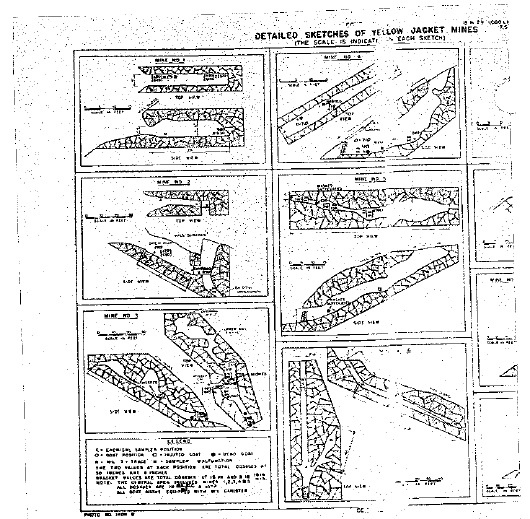 For each area, Army engineers built various kinds of screens and vanes designed to measure the dispersal of chemical agents inside the tunnels. Goats and rabbits (some of whom were outfitted with makeshift gas masks) were placed inside the caves in order to measure the results of the gas and flame attacks. The Army also used different means for dispersing the agents: chemical mortar and artillery shells, rockets, bombs, airplane-mounted spray tanks, and "droppable light case tanks" (the type eventually used for napalm attacks during the Vietnam War). The sites required differing amounts of modification. For example, CWS technicians only had to drill two side tunnels into Camels Back Cave and add several wooden doors to approximate a Japanese cave system. Gas curtains—a type of device that presumably impeded the spread of gas and toxic agents—were added to the Great Western Mine and Yellow Jacket Mine Area in order to simulate potential anti-gas measures. For the River Bed Target Area, however, Army engineers built a model Japanese underground fortification system, complete with turrets, pillboxes, and gunports. Yet there are no architectural drawings, for example, of structures built at the River Bed Target Area. Maps and photographs provide evidence that great care went into building a vast system of reinforced concrete structures. Gunports thus appear as nodes in a subterranean network that spreads along the river bed area. 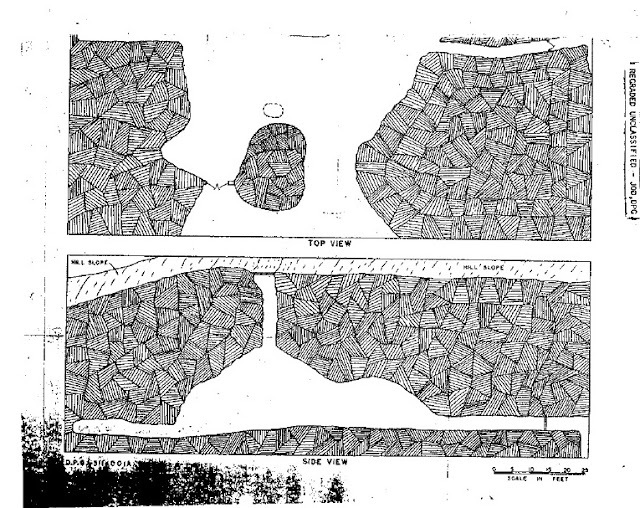 And in one instance, a section drawing of the River Bed Target Area shows how the built system snaked up and through the rocky massifs at Dugway. The report on Project SPHINX does not indicate what kinds of systems were used as inspiration—nothing gives any indication that these systems were modeled on Japanese precedent. 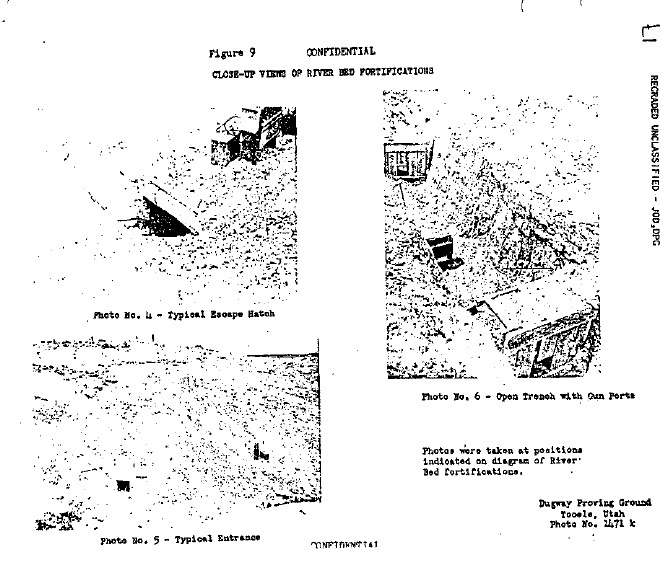 But in an eerie echo of the previous program for testing napalm munitions on German and Japanese architecture, several of the photographs in the report indicate that all the built materials—escape hatches, doors, ports—were all "typical". It is probable that given the urgency with which Project SPHINX was initiated, and the planning required for OLYMPIC, that the Army was relying on past experiences on Guadacanal, Iwo Jima, and Okinawa to assess what, indeed, were typical Japanese fortifications. And here, "typical" could be equated with being good enough for testing purposes. Remarkably, Project SPHINX relied on a more abstracted visual method to communicate test results. 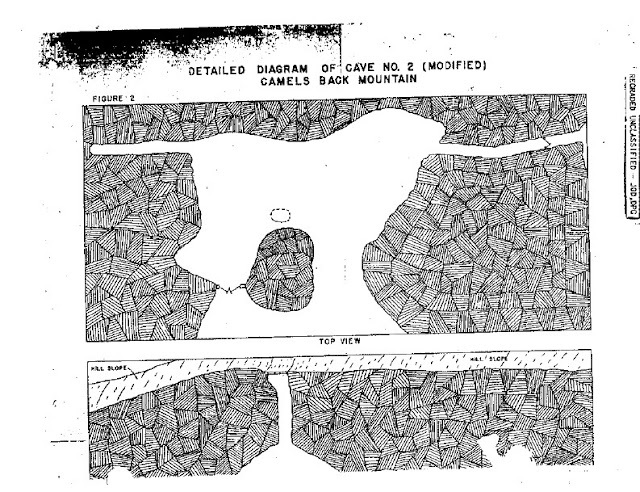 The final report thus included a set of plans and sections of the various caves and tunnels at Camels Back Cave, Great Western Mine, and the Yellow Jacket Mines. At first, these seem like inversions of figure ground diagrams in the sense that they privilege the existence of geological solids that define those voids that eventually form caves and tunnels. Yet drafters depicted the interior of the Dugway mountains as fields of parallel, diagonal lines—a strategy that no doubt differentiates this kind of representation from the drawing of pochés. This is not a display of architectural knowledge, but is rather a decided attempt to show moments of geological and spatial complexity. 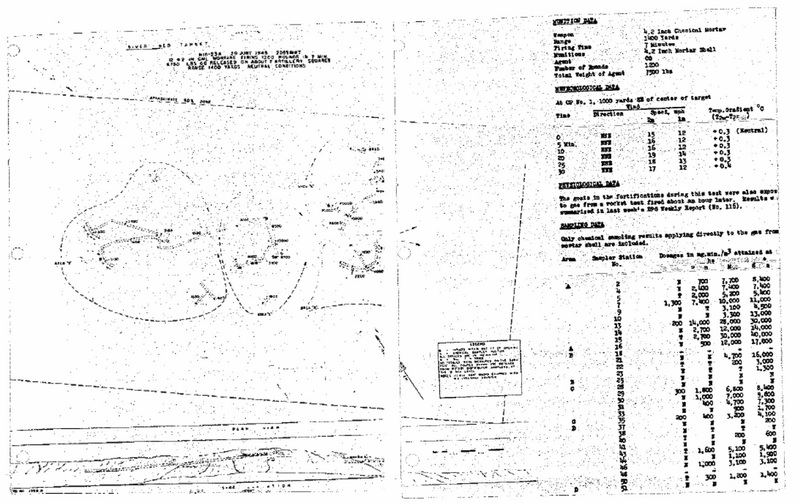 It is appropriate, then, that the drafters labeled these as "diagrams". These are diagrams in the Deleuzeian sense of the term in that they do indeed show "intersecting" forces. Here, however, it is more appropriate to talk of intersecting regimes at work in the Yellow Jacket Mine system. On the one hand, there is a geologic regime, depicted by the crosshatched lines in the "detailed diagrams and sketches". Other diagrams, such as those showing the exact position of goats that perished inside the Camels Back Cave system, are evidence of results of a testing regime similar to the one used for the testing of napalm on German and Japanese architecture. And overall, there is the system of visual representation itself, an example of what Jacques Ranciere calls an "aesthetic regime." 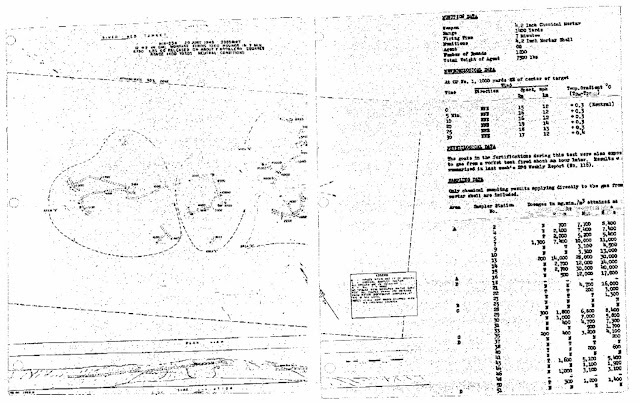 Far more than a way of representing a literal and figurative terrain to communicate these tests results to weapons technicians and military planners, these maps, diagrams, and photographs also show how Project SPHINX relied on visual communication as a requirement for the application of these deadly technologies. 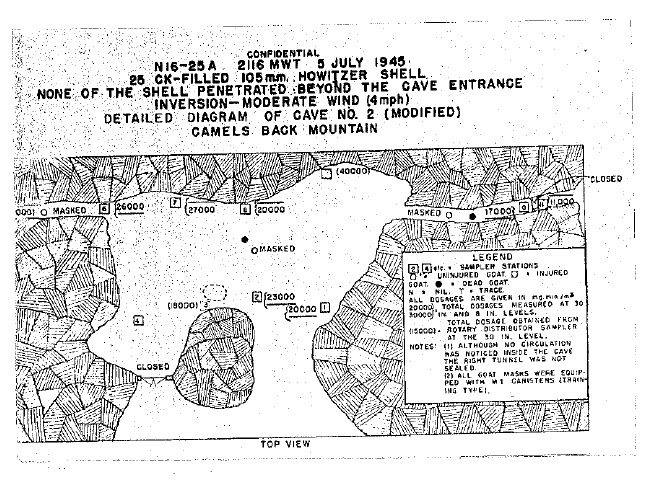 Thus the most detailed series of diagrams and maps—those of the Yellow Jacket Mine and River Bed areas—both show natural conditions such as elevation and the direction of prevalent winds: information necessary for the proper deployment of gas weapons. The dosages (concentration x time) needed to produce death are 5,000, 11,000 and 5,000 mg. min./m3 for [each gas] respectively. Personnel wearing military gas masks are adequately protected against these gases unless dosages sufficient to penetrate the gas mask container are obtained. Of the above three agents, [Cyanogen Chloride] penetrates the Japanese gas mask canister most efficiently; between 200,000 and 400,00- mg. min./m3 is required. Since the Japanese soldier was known to be equipped with a gas mask, the object ... was to achieve canister-penetrating dosages inside the caves. evaporates over a period of time to form a lingering, H-vapor cloud. The rate of evaporation depends upon the ground surface temperature, the wind speed, the vertical temperature gradient, and the site of the mustard droplets. Personnel exposed to mustard vapor absorb the agent into their skin and become casualties. Consequently, gas masks only protect the face and respiratory organs, and protective clothing is required to protect the entire body. It is known that the Japanese soldier does not have adequate protective clothing, and is therefore vulnerable to mustard-vapor attack. With this observation in mind, the CWS concluded that Mustard Gas was especially useful in subduing Japanese soldiers in areas "containing a large number of caves or a complex underground fortification ... whether or not the location of the openings are known." For this reason, the CWS concluded that Mustard Gas was the toxin to use for an attack like that planned for OLYMPIC. The German philosopher Peter Sloterdijk observes that "The 20th century dawned in a spectacular revelation on April 22, 1915, when a specially formed German 'gas regiment' launched the first, large-scale operation against French-Canadian troops in the northern Ypres Salient using chlorine gas as their means of combat." Gas combat is therefore coextensive with modernity; or put another way, modernity coincided with the development of "Atmoterrorism"—the decided targeting of environments for tactical and strategic means. Such warfare has a heavy design component, and Sloterdijk reminds us how "With the phenomenon of gas warfare, the fact of the living organism's immersion in a breathable milieu arrives at the level of formal representation, bringing the climactic and atmospheric conditions pertaining to human life to a new level of explication." It may take something larger than a conceptual link to consider this statement as one that equates gas warfare with a design problem—but in looking at the drawings, sketches, and photographs that document Project SPHINX's achievements, we cannot help but see their explanatory nature as a visual response to an intractable problem. "To invade Japan, we must use gas. To use gas, we must make diagrams", so the logic would go. Beyond the targeting of life-supporting air, gas warfare can also be thought of as a kind of atmosphere design, the creation of envelopes of air processed and manufactured to kill. Looked in this way, then, the manufacture of gas not only includes the Ypres Salient and the manufacturing of Zyklon B, but also the disasters at Bhopal as well as the aerial warfare depicted in H.G. Wells's The War in the Air (1908). In that book, it is not so much the use of incendiary bombs, but the manufacturing of fleets of giant gas-filled airship that leads an officer aboard a German airship to declare, "The war comes through the air, bombs drop in the night. Quiet people go out in the morning, and see air-fleets passing overhead—dripping death—dripping death!" The trajectory of atmospheric events that includes, among other things, Slotedijk's invocation of the Ypres Salient, negligence at Bhopal, atrocities at Auschwitz, and Project SPHINX, finds another point of confluence, also with a specific day and time. 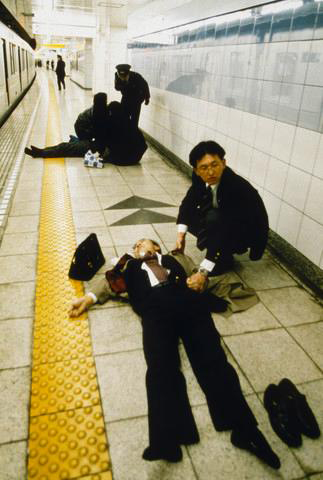 On Monday, March 20, 1995, members of the Aum Shinrikyo cult performed a coordinated gas attack on the Tokyo subway. The weapon of choice here was sarin, a deadly nerve toxin so powerful that a pinhead-sized drop could be enough to kill an adult male. On that March morning, Aum Shinrikyo members Ikuo Hayashi, Kenichi Hirose, Toru Toyoda, Masato Yokoyama, and Yasuo Hayashi all dropped newspaper-bundles each containing a bag filled with liquid sarin. According to their plan, they punctured the bags with sharpened tips of umbrellas and promptly left. Although some of the perpetrators were affected by the sarin release, the attack killed seven and injured 500. It may be too much to say that the Subway Sarin Incident was a direct result of the types of investigations spearheaded by the CWS and Project SPHINX in 1945. Sarin had already been used in the Iran-Iraq War, and had allegedly been used during the Pinochet regime. It certainly bears mentioning that Sarin Subway Incident was the deadliest attack on Japanese soil since the Second World War, so in a certain sense it does show how some of Project SPHINX 's objectives came to fruition almost 40 years later. The last word on this belongs to the Japanese author Haruki Murakami. In 2000, an English translation of Murakami's Underground (originally published in 1997-98 as Andāguraundo) appeared, exposing to English-speaking audiences some first-hand accounts of that day in March. The book remains a powerful document, a testament to the heinous nature of gas warfare. And yet Murakami's interviews with victim and perpetrator alike demonstrate how the principles behind the intended attack on Kyushu and the Subway Sarin Incident are basically the same. The unifying link is air. Michiaki Tamada, a subway conductor who survived the attacks, would put it best when he told Murakami about the atmosphere on the morning of March 20, 1945: "[S]omething felt wrong inside the train. After the second or third car I couldn't help thinking, "Something's different." It wasn't so much a smell; it was just a hunch: "Something's weird here." Everyone sweats, so the odor of their bodies, the smell of their clothes leave an indelible mark. Ride the trains every day and you know what's regular air, and you pick up on anything that's not quite the same." Quoted in Michael Sherry, The Rise of American Air Power: The Creation of Armageddon (New Haven: Yale University Press, 1987) p. 109. Dugway Proving Ground Memorandum Report No. 26, Project SPHINX: Attack Against Cave-Type Fortifications (25 October 1945), n.p. All information in the post related to Project SPHINX can be found in this document. Peter Sloterdijk, Terror From The Air, Amy Patton and Steve Corcoran, trans. (Los Angeles: Semiotext(e), 2009), pp. 9-10. Ibid., p. 23 (Italics added). H.G. Wells, The War in the Air (London: George Bell and Sons, 1908), p. 240 (italics added). Haruki Murakami, Underground: The Tokyo Gas Attack and the Japanese Psyche, Alfred Birnbaum and Philip Gabriel, trans. (New York: Vintage, 200), p. 156. I recently posted something connected to Sloterdijk's linking of atmo-terrorism and atmospheric explicitation. Yes, Carl, I've seen your piece. Thank you for reminding me about it ... it's a very good post! Fantastic post! I didn't know I could get so excited about gas attacks and dead goats. Note as well that the CWS was planning to use captured German Nerve agents in the event of the invasion of Japan. "Operation Davy Jones Locker involved sinking ships that contained German weapons in the North Sea. However, not all the German weapons were destroyed. sizes, over 2,700 nitrogen mustard rockets, and about 750 tabun artillery shells of various sizes were shipped to the United States." to address shortages based on required estimates for a chemical attack of Japan. 10.5-cm projectiles could be used in US howitzers (105-mm) with worn tubes because German shells were slightly wider than US 105-mm shells.117 In the end, Japan surrendered after nuclear bombs were dropped on Nagasaki and Hiroshima, and chemical warfare in the Pacific was averted."